Why are books that are the entertainment choice for millions of women singled out for derision? 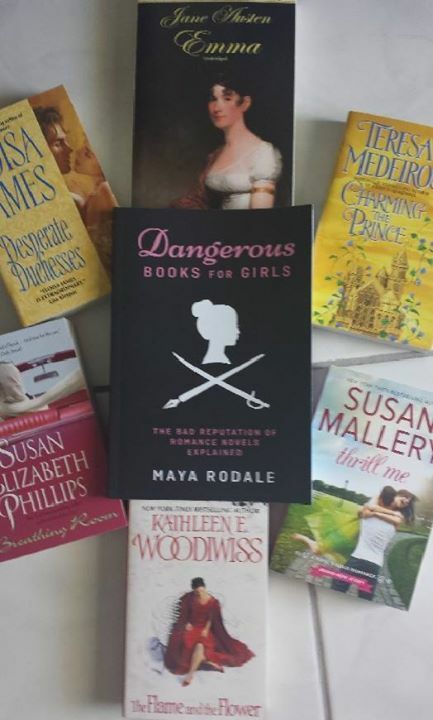 Dangerous Books for Girls author Maya Rodale explains the bad reputation of romance novels and inspired me to be more vocal about changing preconceived notions of books written by women, for women, and starring-- women. I'm sharing Dangerous Books for Girls with as many readers as possible. I'm giving away a copy here in this prize pack full of “Dangerous Books” and asking you to share my mission. Learn more about why romance is dismissed and then.... don't let it be. Our voices are important, our entertainment is our own choice, and our pursuit of happiness is worthwhile- in fiction and in real life. Giveaway- Win the prize pack of deliciously dangerous reads! If you need a syllabus in romance, I’ve got your Master’s class right here. I’m posting this on all my social media homes and you can enter to win one of six ways- reblog on Tumblr, Share on Facebook, Share on Google Plus, Pin or Repin on Pinterest, Regram on IG or post on Twitter-- in other words... spread the word and share my mission! Use the hashtag #Ireadromanceto claim romance as your choice. Winner announced 9/30. Open to INTL readers.